The automotive industry has evolved over the past 100 years, from steam locomotives to diesel locomotives, from hybrid cars to pure electric vehicles, with the help of technology and electronics it is progressing rapidly. And now, the unmanned smart car is no longer a distant future. With the continuous evolution of electronic and wireless technology, plus the popularization of smart handheld devices and the support from car manufacturers, "Internet of Vehicles" (IOV) and "smart mobility" have become two focus of global car manufacturers. 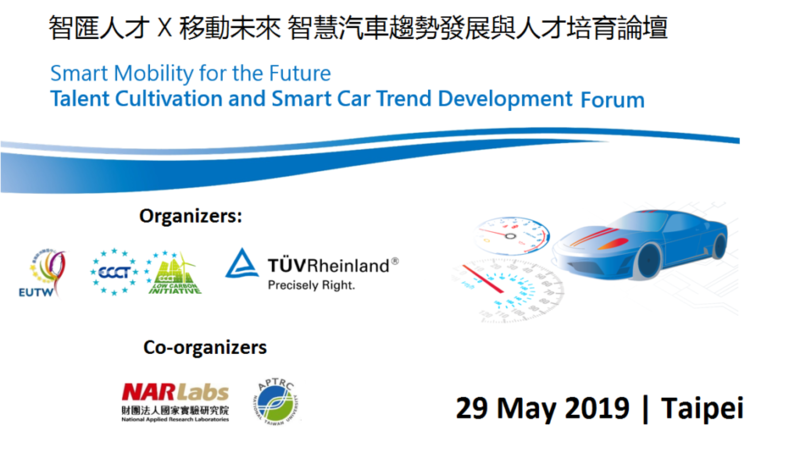 On May 29 in Taipei, European Union Centre Taiwan (EUTW), ECCT Low Carbon Initiative (LCI) and TÜV Rheinland will organize the Smart Mobility for Cities of Tomorrow & Talents for Innovation Forum which will provide the latest market trends and industry information, as well as discuss how to get access to the new market and seize new business opportunities to meet the revolutionary era of the automotive industry. This one-day event invites executives and experts from industry and academia to delve into policies, technical capabilities and market trends associated with IOV and smart mobility.